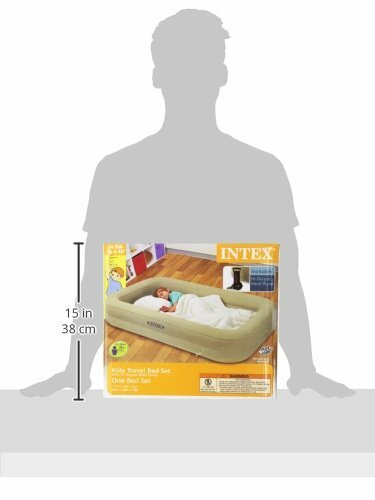 1 How Does A Toddler Travel Bed Differ From A Travel Crib? 3 What are the best toddler travel beds? 3.1 See the top rated toddler travel bed here. 4 What age are toddler travel beds suitable for? 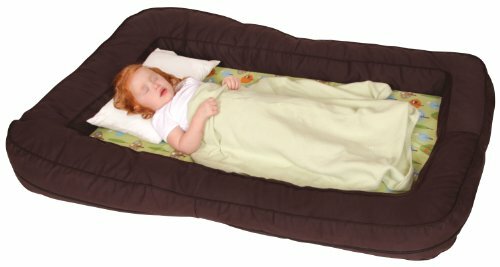 How Does A Toddler Travel Bed Differ From A Travel Crib? 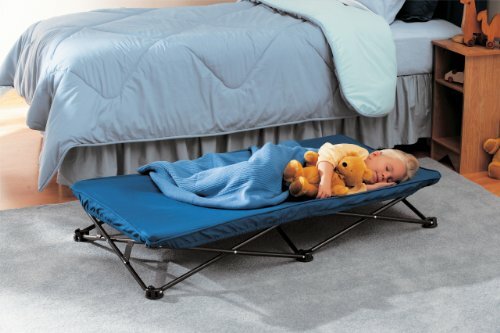 A toddler travel bed is basically a fold out bed which is suitable for toddler sized children. Unlike travel cribs, they do not have high walls and do not contain the toddler. If you are unsure if you should be buying a travel crib or a travel toddler bed, check out our article about which to choose. There are several types – some fold straight out, some require assembling and other require inflating. If you would like a toddler travel crib – one that contains your child more than a travel bed and is a travel crib suitable for toddlers, check out the travel crib guide here. There are many toddler travel cribs available. If you know you want a toddler travel bed but don’t know which one, use the toddler travel bed comparison chart below to help compare features. You can sort the table by clicking on the columns. As with everything, this all depends on what you are looking for. The main aspects are usually how compact the toddler travel bed is vs how easy to assemble. If you are looking for a travel toddler bed that is very comfortable, easy to assemble and also makes for a great play area, check out the Leachco BumpZZZ. This is like a roll out mattress with side barriers. It is very comfortable and can be folded over to convert it to a cushioned seat for your child as well. The downside of this type is that they are not as compact or as lightweight as an inflatable travel bed making this an option best suited for road trips rather than air travel. If you travel a lot and you want a travel bed for toddlers that is as compact and lightweight as possible then it is worth investigating inflatable toddler travel beds. These fold up far smaller and are lighter. However, they have the drawback that they need inflating, so the set up time is increased. 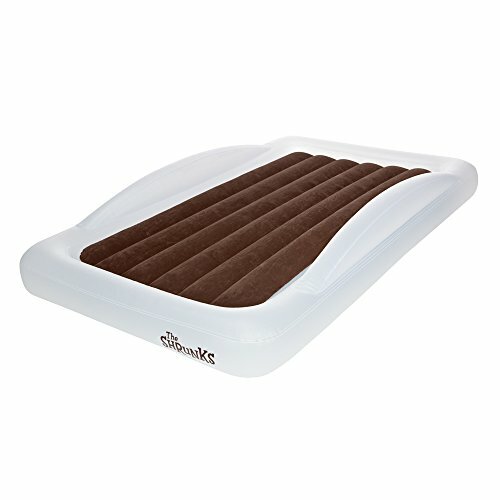 If you want a travel bed in this category, the best one is the Shrunks Indoor Toddler Inflatable Bed. Read more in our guide to inflatable toddler travel beds. Another toddler travel bed option is a collapsible travel cot, like the Regalo My Cot. Cots such as these have a canvas top that goes over a frame, raising the bed off the group. The set up time compared to inflatable travel bed is much less, often less than a minute. However the downside is that they do not fold up as small or are as light as an inflatable travel bed once deflated. These beds do not contain children as well as other types either. The main advantages to these types of beds are their strength and robustness and easiness to keep clean. This means they can be used outdoors as well as indoors, as a place to sit or nap. See the top rated toddler travel bed here. All toddler travel beds mentioned on this site meet American safety standards. 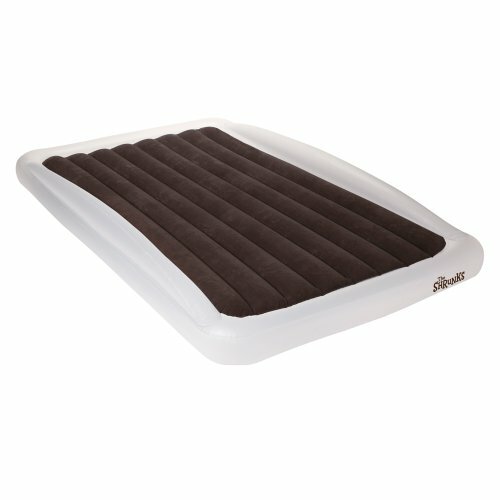 What age are toddler travel beds suitable for? The best travel beds for toddlers are a good choice for children who are two or older, as they should suit them for a long time. All of the above travel beds are recommended for 2 – 5+ year olds but in reality, they will probably fit these beds for far longer than this. For older kids, read our article about the best kids’ travel beds. If your child is still in a crib at home, you may want to consider a travel crib instead. If your child is two, a travel bed can be a better option since it will last longer. The downside, of course, is that it will not keep your toddler contained, so if your child is not used to the freedom of a bed, there may be a bit of pain initially. Read our guide to the best travel cribs. If you are unsure whether your toddler is ready for a toddler bed yet, check out this article. A great option for children that may have outgrown their travel crib is the Shrunks indoor inflatable travel bed. This bed is inflatable, making it a smart option for families on the go. The bed dissembles at 7.7 lbs and can be folded up compactly into a drawstring bag making for easy transportation. The Shrunk travel bed lays low on the ground ensuring little chance of accidental injury from rolling off, and with ridged sides it is secure and confined. Meeting the new tough safety standards, the bed is overall a safe and secure travel bed for travelling families. Click here to see more information and the latest prices. The Leachco Bumpzzz travel bed is a top travel bed not only due to its convenience, but because it is one of the safest travel beds available, with soft padding, a large surface for playing and allergen free foam. Ideal for children aged between 2-5 years, you can also use this particular bed for camping trips or sleepovers, as it is very easy to put up and down, and take with you – again, there is a matching travel case. The Shrunks sleepover kids travel bed features a signature sheet-tuck that fits all standard twin sized sheets, trademarked security rails preventing your child rolling off. The bed is inflatable and inflates in just one minute. It is a larger option than the Shrunks bed above and instead of being for toddlers, it’s for kids aged 5-8. Read our in depth reviews of the Shrunks Indoor Toddler Inflatable Travel Bed, the Leachco BumpZZZ, the Aerobed Mattress and the Regalo Portable Bed. These are some of the best portable toddler beds.